I hope you all enjoyed Christmas Day and it passed as stress-free as possible. I certainly did. For the last few years I have been escaping the city with friends and heading off to the beautiful Lake District to seek some fresh air and go walking. I've rambled around Rydal Water on Christmas Day 2009 and Elterwater on Christmas Day 2011, (on Christmas Day 2010 we only got as far as Windermere due to the very heavy snow!) 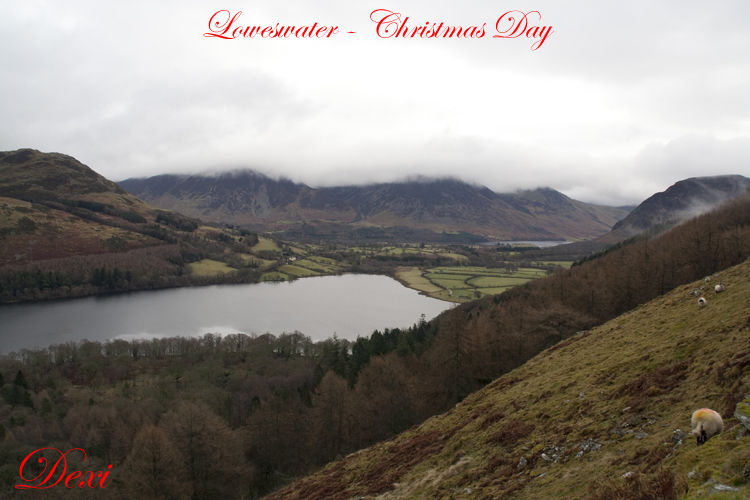 and this year it was the turn of secluded Loweswater. The weather was a bit worrying as we set off from Manchester in the rain, so I took along my new heeled wellington boots in anticipation of some boggy ground. The heavy rain hadn't cleared by the time we reached Kendal, but luckily we decided to persevere, and by the time we had reached Loweswater we were faced with some low cloud... but no rain. There was a steady climb up onto Darley Fell, reaching around 250m, where the above picture was taken, and although not too high gave a stunning view down to the lake and Crummock Water beyond. There were a few other walkers out and about, all very friendly and there were lots of Christmas greetings being passed. A bonus for me, too, was the number of dogs being given a Christmas Day walk. I suppose it gave a different meaning to 'swinging' than what I usually think of, but it was definitely a view to savour. After finishing the walk we headed off to nearby Keswick, one of my favourite towns, for some well-earned refreshments. Sadly, my favourite inn, the Dog and Gun Inn was closed, but the fabulous The Inn At Keswick more than made it up for it. A lovely friendly atmosphere, Christmas tree and decorations, lots of tired pooches and a great selection of beers and whisky. It was a very refreshed and relaxed Dexi that returned home to Manchester that evening. Next, of course, is New Year's Eve, which I am certainly looking forward to, as there is a very special New Year's Eve event that I am attending. It's been just over a week since the last update on the website regarding my Picture Of The Week, so it's time for a change - I fell in love with the bodystocking featured, and as it leaves plenty of, er, access, I'll be aiming to do some rather more explicit shots in it in the new year. Until then, have a great New Year's Eve, and I'll see you in 2013.